The discography of the German conductor Hermann Max is very impressive. What is most striking is the number of unfamiliar compositions he has recorded, among them German oratorios of the late 18th and early 19th centuries. Although he does perform Italian, French and English music, music by German composers is at the core of his activities. Now and then Max also performs standard repertoire. He has previously recorded Bach's Passions, the B minor Mass and the Magnificat as well as Monteverdi's Vespro della Beata Vergine and Telemann's cantata Die Tageszeiten. 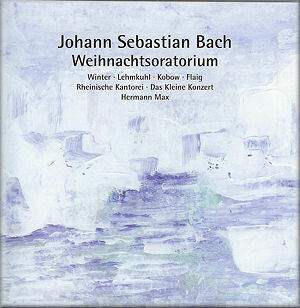 Bach's Christmas Oratorio was an obvious lacuna in his discography. Hermann Max started his own choir in 1977; it became the Rheinische Kantorei in 1985. The booklet tells us that "Hermann Max has for many years trained the choir in accordance with the Italian ideals of the seventeenth and eighteenth centuries. Its bright, radiant sound, careful diction, perfect intonation, transparency, facility and agility lend it an unmistakable quality". These ideals are realised in the many recordings he has made with his choir, including this new recording of the Christmas Oratorio. At the same time it has to be said that his performances are sometimes less dramatic than others, and that is also noticeable here. Max not only has his own choir but also his own orchestra. This guarantees a great consistency in style. In addition he often works with the same soloists, some of whom started their career as members of his choir. The soprano in this recording, Veronika Winter, still sings in the choir, and does so here too. In Max's recordings no soloist is out of step with his approach and as a result his performances are characterised by a great stylistic consistency. This recording attests to that once again. Let us have a look at this recording and start with the choruses. Every cantata, with the exception of the second, begins with a chorus. The opening chorus of the first cantata, 'Jauchzet, frohlocket' gets a brisk performance, but Max avoids a breakneck speed which would make good articulation and dynamic accents impossible to realise. Sharp accents are used in the opening chorus of the third cantata, 'Herrscher des Himmels, erhöre das Lallen'. It is one of the highlights of this recording. The fourth cantata begins with the chorus 'Fallt mit Danken, fallt mit Loben', which is sung in a beautiful relaxed way. Again the tempo is good without any exaggeration. There are some telling accents in the B section on the words "der Feinde Wut und Toben" (the rage and fury of the fiend). The fifth cantata opens with the chorus 'Ehre sei dir Gott, gesungen'. It is one of my favourite parts of the Christmas Oratorio, and it is given a buoyant performance, with subtle dynamic accents. That said I would have liked the singing to be slightly more powerful and incisive. The chorus 'Herr, wenn die stolzen Feinde schnauben' which opens the sixth cantata is the most dramatic chorus of the oratorio with its parts for trumpets and timpani. They are used to great effect and create some strong dynamic contrasts. The balance between the choir - consisting of sixteen singers - and the orchestra is good in the opening choruses of the first, third and sixth cantata which all have parts for trumpets. In the other two the instruments - oboes and horns with strings in Cantata No. 4 and oboes with strings in Cantata No. 5 - are not always clearly audible. In Cantata No. 2 the choir also sings the chorus of the angels, 'Ehre sei Gott', which should have been more jubilant than we get here. The chorales are beautifully sung, with an excellent expression of the text. Again things would have been improved had there been stronger accents and a little less legato. Next the soloists. The tenor has no easy job in Bach's Christmas Oratorio. Not only does he act as the Evangelist, but he also has three arias to sing each of which is technically demanding. Jan Kobow is a seasoned interpreter of the role of the Evangelist in Bach's Passions, and that shows here. His delivery of the text is crisp and clear and he takes the necessary freedom in his treatment of the rhythm of the recitatives. He sings the arias pretty well, but the passagework doesn't come off as easily as the recitatives. He is most convincing in 'Frohe Hirten, eilt, ach eilet', as the tempo is relatively moderate. In many performances on period instruments the alto parts are sung by male altos. Wiebke Lehmkuhl is a female alto, and I mean a real alto, not a mezzo. She has a pretty dark voice, with a pleasant warm timbre. I hadn't heard her before, and I am impressed by what she has to offer. In the first cantata she gives an excellent speech-like account of the recitative 'Nun wird mein liebster Bräutigam', which is followed by a beautifully sung aria 'Bereite dich, Zion'. The timbre of her voice is ideally suited to this aria, and in the B section she uses a fine messa di voce on the long notes. The aria in the second cantata, 'Schlafe, mein Liebster', is one of Bach's most famous and most beautiful. Ms Lehmkuhl's performance is intimate and sensitive, and again she uses her messa di voce to great effect. Although she is a real alto, she has no problems with the top notes. Markus Flaig is a real bass rather than a baritone. His voice perfectly suits the aria 'Großer Herr, o starker König' (Cantata No. 1) . His diction is outstanding and every word is clearly audible. Although Flaig sings the second bass aria 'Erleucht auch meine finstre Sinnen' (Cantata No. 5) quite well a somewhat lighter voice would have been preferable. The soprano Veronika Winter is light and agile, which reminds me of the voice of a treble. That is not a bad thing, but sometimes I find her singing a bit bland. For instance, the recitative 'Du Falscher, suche nur den Herrn zu fällen' and the aria 'Nur ein Wink von seinen Händen' (Cantata No. 6) are too introverted and could do with more bite. The famous aria 'Flößt mein Heiland' (Cantata No. 4) is beautifully sung, with another member from the choir singing the echo. Fortunately the echo hasn't been placed too much in the background. Perfect is Ms Winter's performance of the chorale melodies in 'Er ist auf Erden kommen arm' (Cantata No. 1) and 'Jesu, meine Freud und Wonne' (Cantata No. 4), each with a recitative for bass. Here the balance between the two voices is remarkably good, despite their difference in power. In the duet 'Herr, dein Mitleid' (Cantata No. 3) Markus Flaig again is able to adapt his voice to Ms Winter's and as a result this piece is another highlight. In the terzetto 'Ach, wenn wird die Zeit erscheinen' (Cantata No. 5) the alto contrasts effectively with the soprano and tenor. Das Kleine Konzert is a very fine ensemble which shows once again in this recording. The Sinfonia that opens the second cantata is just outstanding. The marked but not exaggerated dynamic accents result in a subtly swaying rhythm. The solo parts in the arias are well executed. There is some nice ornamentation in the trumpet part of the bass aria 'Großer Herr, du starker König'. And the solo violin part in the terzetto I just mentioned is given a spirited performance. In some arias the instrumental parts are a bit under-exposed, though. The players are sometimes too restrained and could have been accorded more presence. From my description one may gather that this is not the most dramatic performance one could imagine. It is rather intimate and fully concentrates on the delivery of the text and the expression of the Affekts. I have no problems with that, on the contrary, but I think in some parts the music requires a more extraverted approach. What is really unsatisfying is the low dynamic level of the recording. While listening I turned up to the full the volume control of my headphones but the sound was still too soft. When I listened to these discs on my amplifier I also had to turn up the volume above standard level. Lastly: this is an SACD which is playable on any conventional CD player. But one of my CD players didn't recognize the index of the first disc and therefore refused to play it. Hopefully it is just my copy which had this problem. I am in two minds about this recording. On the one hand I very much enjoyed it because of the quality of singing and playing. There are hardly any flaws in this respect. As I stated earlier Hermann Max's recordings are always stylistically consistent, and that is certainly the case here as well. However I find the performance as a whole too introverted, and the dramatic elements are under-exposed. The character of the recording enhances the impression of a performance which is too restrained. I would not have wanted to miss this recording, but it is not going to be at the top of my list of favourite recordings of the Christmas Oratorio.